Scythebill 13.9 is now available! As always, download here, and let me know if you have any problems, either on Google+, Facebook, or by email. This version updates the definition of the ABA region - most notably, now including Hawaii, and includes some other fixes. As of the ABA Checklist Version 8.0, Hawaii (including the Northwestern Islands, like Midway) is now part of the ABA Region. Scythebill now adopts that treatment. If you want to keep track of the old definition, Scythebill has added a reporting region called "ABA region (without Hawaii)". Related to ABA listing, though not the ABA region itself: the Azores and Madeira are now included in Europe, after confirming this treatment with the ABA listing committee. The Scythebill installer will now add desktop shortcuts on Windows and Linux. Banggai and Taliabu Leaf Warblers - two undescribed taxa from Indonesia - are now supported. 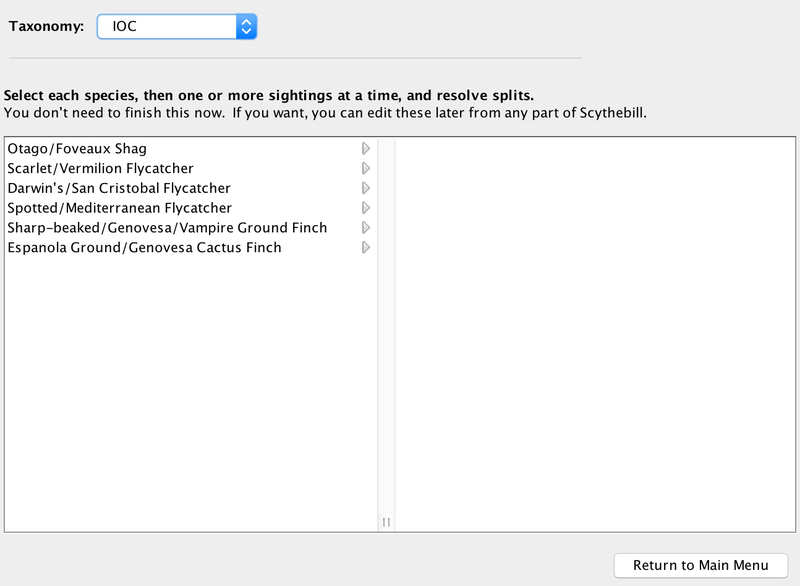 The preferences for IOC and eBird/Clements common names previously included an "English (UK)" option which confused multiple users. It makes Scythebill use BOU names where applicable, names like "Wren" and "Swallow". It's been renamed to "English (BOU)" to make clear its intent. As always, there's lots of small checklist improvements reflecting both corrections and recent new records. The "Verify against checklists..." feature would incorrectly report some species as not found in the United Kingdom (e.g. Black-bellied/Grey Plover). If you accidentally dragged some built-in locations (e.g. "Orange County") out of their parent, and wanted to move it back to its original location, Scythebill would give an error message. This is fixed. One user reported that on Windows 10, trying to import a checklist was now crashing Scythebill! This should be resolved, though it apparently was not happening to most users. Fixed an error ("Comparison method violates...") that could happen in "Browse by species" in some unusual cases. 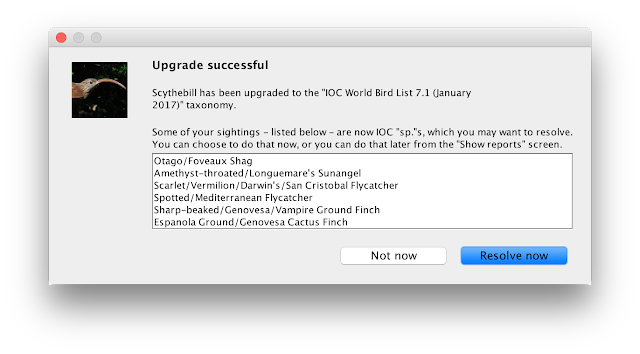 Fixed an error triggered when editing a custom checklist and then switching between IOC and eBird/Clements. Exporting eBird checklists for Puerto Rico, the US Virgin Islands, and the Northern Marianas would potentially not handle those regions' "states" correctly. The built-in checklist for the Åland Islands was not loading. Scythebill 13.7 is now available! As always, download here, and let me know if you have any problems, either on Google+, Facebook, or by email. This version includes the just-released IOC 7.3 taxonomy, improvements to Scythebill's location database, and a number of bug fixes. Thank you to all of the users who reported these bugs! Your help in keeping Scythebill reliable is invaluable. Thayer's Gull is, at long last, lumped into Iceland Gull. Baird's Junco is split from Yellow-eyed Junco. Glossy Swiftlet has been split 8 ways! Two southern Indian laughingthrushes (Black-chinned and Kerala) have each been split in two. Silktail, an enigmatic Fijian endemic, has been split in two. You can see the full list of splits, lumps, and other changes on the IOC website. One note: while most of these splits are automatically handled to the extent possible, the Common/Lesser Redpoll split is not. All sightings will be kept as Common Redpoll, unfortunately. At a very loose level, Common Redpoll is the form in most of the world, so North American records can be left alone. But Lesser Redpoll predominates in Great Britain and Ireland, and is common in northwestern and central Europe. Lesser Redpoll is also the form introduced into New Zealand. This definition does not follow the ABA listing regions. For those of you that care about that, I've added an "Australasia (ABA)" location that can be used in reports. There's also a new checklist within this region, for "North Solomons (Bougainville)" (politically, part of Papua New Guinea, but biogeographically part of the Solomon Islands). And for the truly nitpicking among you, I'm working with ABA rules committee members to clarify some as-yet ambiguous rules in some of their listing regions. Scythebill has updated its location database to reflect the last couple years worth of changes (and to properly align with eBird). This should mostly be pretty transparent to all of you, but if you've been birding in Latvia and have been assigning sightings to Latvian districts, that work is likely for naught; its political organization is now totally different. For the detail-oriented among you, the Åland Islands are no longer treated as a top-level country, but instead as a province of Finland; this means the "Finland (with Åland Islands)" location is no longer necessary or available. If you were building your own extended taxonomies, there were some glitches when entering sightings just after importing your own .csv taxonomy file. Those are fixed. Scythebill's "choose your own abbreviation" feature did not work well for some accented characters found in Turkish names, in states like "Şırnak". Entering IOC sightings for the Moluccan and North Solomons Dwarf Kingfishers did not assign those sightings to the correct species! As always, this release of Scythebill includes a number of recent country records as well as small checklist fixes here and there. Scythebill 13.6 is now available! As always, download here, and let me know if you have any problems, either on Google+, Facebook, or by email. This version includes the just-released IOC 7.2 taxonomy, and includes a number of bug fixes. Thank you to all of the users who reported these bugs! Your help in keeping Scythebill reliable is invaluable. Barn Owls in the Americas are now split as American Barn Owl. Checklists saved from Browse by location had two repeating rows at the top, instead of just the one intended header row. Imports with "spuh" common names (like Greater/Lesser Scaup) will now import correctly. Scythebill automatically sets "introduced" when you enter species that are known to be introduced (either from the checklists or simply because it's a domestic or feral form), but wasn't doing so for imports. It now does so correctly. A glitch surrounding "First records (lifers)" reports for IOC users has been addressed. The New Mexico county of Doña Ana displayed oddly, with a symbol where "ñ" should be. A scenario where users could inadvertently corrupt their saved locations when rearranging them in Browse by locations has been fixed. eBird locations were not available in the UK; that's been addressed. Scythebill 13.5.0 is now available! As always, download here, and let me know if you have any problems, either on Google+, Facebook, or by email. This release includes the IOC 7.1 list, and (at long last), IOC users get the same easy resolution on upgrade that eBird/Clements users have come to expect. IOC includes a number of splits, mostly from South America, listed in full here. Previously, upgrading to a new IOC list forced you to manually visit Show reports to track down any splits, and resolve them one-by-one (if you remembered!). 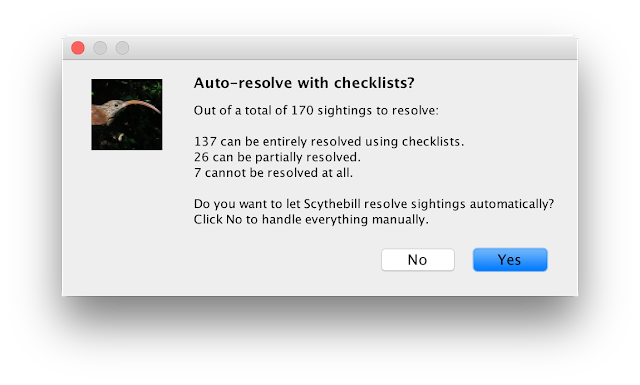 Scythebill's used its checklists to automatically fix most of your sightings, and reduce the number of choices for most of what's left. (In this case, for example, Scythebill doesn't have single island checklists for the Galapagos, so those splits can't be automated.) If you don't trust the checklists, you can click No and do all the work yourself - or you can click Yes, and let Scythebill do most of the work for you; if there's still some splits left, you'll get one last screen to manually resolve whatever Scythebill couldn't handle. Hopefully, this will make things far simpler for IOC users to keep up with all the splits headed our way. One change that is not automatically handled for IOC users this time around is a subtle change in the IOC's split between Eastern and Western Barn Owl. In IOC 6.4, the boundary between the two forms was in the Lesser Sundas, in Eastern Indonesia. In IOC 7.1, this has changed - everything west through Pakistan (subspecies stertens and javanica) is now part of Eastern Barn Owl. So if you've got sightings in Western Barn Owl from South or Southeastern Asia, and did not assign those sightings to one of those subspecies, you'll have to move the sightings yourself to Eastern Barn Owl. As part of this, I've introduced an artificial group to the eBird/Clements taxonomy - "Barn Owl (South Asian)". This is not an actual eBird/Clements group - but don't worry, as any sightings you record for that group will automatically be reported to eBird as "Barn Owl (Eurasian)". Hopefully, the 2017 eBird/Clements taxonomic update will clean this up. The Mozambique state of Maputo is now properly included in the "Southern Africa" report. Scythebill has its usual suite of checklist improvements. In this release, I've finished comparing the Scythebill checklists against all the eBird checklists, handling all the countries from T(anzania) to Z(imbabwe). A number of recent first country records have also been added. Scythebill 13.4.1 is now available! As always, download here, and let me know if you have any problems, either on Google+, Facebook, or by email. This release is largely a bug fix and cleanup release, with a number of small features and fixes recently requested by users. There's a new "Family" report option, which lets you select sightings from a single family. This is, perhaps, most useful in conjunction with "Special reports" - you can figure out in which country you've seen the most hummingbirds, or your best big day for waterfowl, and so forth. The "IUCN Red List" report option was broken if you'd added any sightings in extended (non-bird) taxonomies. The AOU region now properly includes Hawaii (as well as Midway, Clipperton Island, and Johnston Atoll). The ABA region intentionally does not include Hawaii, yet - the rules committee has not yet codified this change, but will in 2017. Remembered "total ticks" reports did not get saved properly; they will now. Scythebill has long detected duplicate entries when importing. Previously, you only had the option of cancelling the entire import, or dropping the duplicates. Scythebill now offers another option - overwriting existing sightings with the duplicates. This is handy if you've improved the data in the original source. However, note that Scythebill only considers a sighting a duplicate if it's on the same date and is exactly the same taxon! So if you've updated a subspecies, for example, you'll end up with two sightings, since it won't look like a duplicate. Ornitho imports should now properly handle Bean Goose imports. Absent a subspecies, they will be imported as a Tundra/Taiga Bean-Goose "spuh"; with a subspecies, they will be assigned correctly. Observado imports will automatically set the "Photographed" bit and attach the URL of the Observado sighting if any photographs are included with that sighting. eBird imports of the "life list" and "checklist" formats should now be more successful when you are importing from some non-English languages. 13.4.0 added a new keyboard shortcut in Enter sightings lets you navigate between the detail rows of a table when entering sightings - but it chose a keystroke on Windows (Control-Alt-Up/Down) that was already taken. It now uses Shift-Alt-Up/Down. As always, this version of Scythebill includes further checklist improvements. 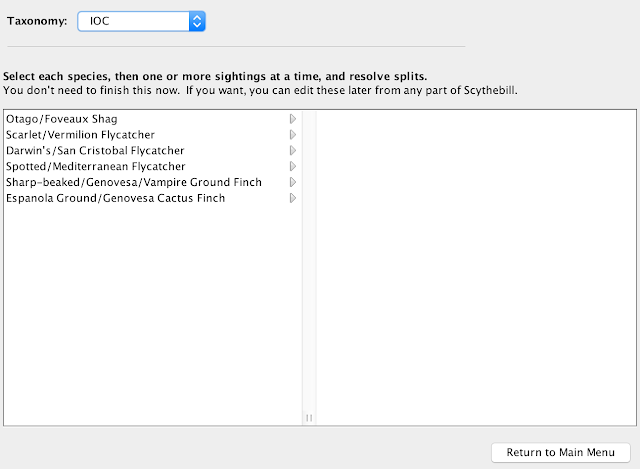 In particular, I've been working through all the eBird data, looking for species omitted from Scythebill checklists. As of this release, I've checked against every country (alphabetically) from Afghanistan to Syria.